The final decision on the Eden Hazard transfer story became headlines in most major sport websites and sport newspapers worldwide yesterday. Which player has the same style and vista as Eden Hazard? We found him, and the name is … Michael Laudrup! Tribute video from Lille to Eden Hazard for 7 wonderful years. Enjoy! Lille TV has made a tribute video for Eden as a sign of appreciation. Eden came to Lille 7 years ago, grew up from a boy to a man, and made a true success story. Who will transfer Eden Hazard? Manchester City, Manchester united, or…. Chelsea? Eden Hazard leaves Lille in Great Style with a HATTRICK ! 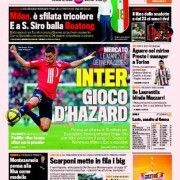 INTER is interested in Eden Hazard. 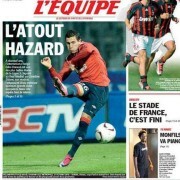 Massimo Moratti, president of Champions League-winner Inter, has shown his interest for Hazard. 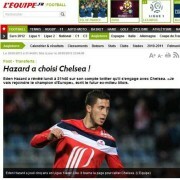 Eden Hazard Best Player of Season 2011-2012 in France by Sport Newspaper L’équipe! Eden Hazard has done it again! He was elected as Best Player of the Year in France for season 2011-2012, by Newspaper L’équipe.